What more could we seek after our two days at Petra? Our return to the tomb-temple called the Treasury was a quiet way to rethink our whole time there. Our path was marked by candles in paper bags on each side, about 4 metres apart. The event was organised by the local people and we were led by one who asked us to be silent. Just the shuffle of 400 feet as the gorge became narrower and narrower until we burst into the open space lit by thousands of candles in front of the Treasury. We sat and listened to a lone singer-narrator, like a medieval troubadour, who told of olden times in a medley of languages. Little was understood, much felt. Then a tired return to pack. Friday, a day of rest with roads full of – ‘Friday’ drivers. 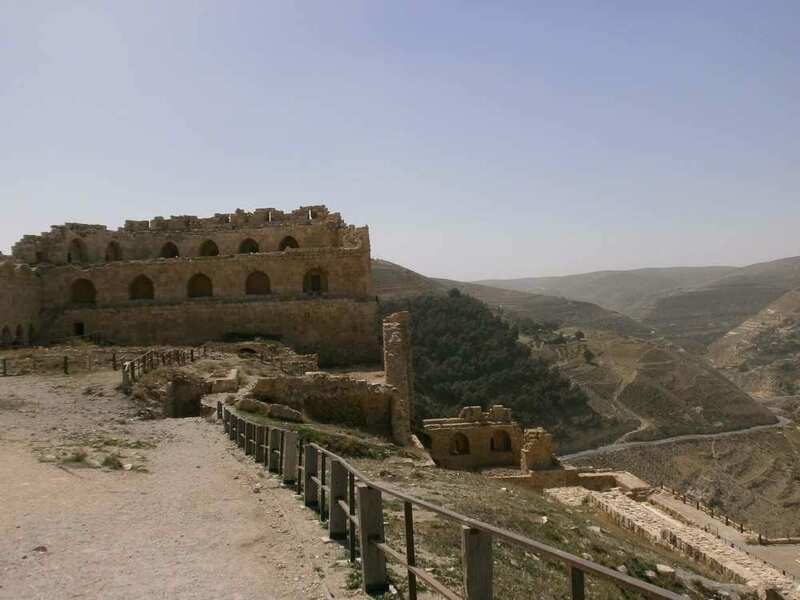 Kerak castle, towering on a crest overlooking the city and the Royal Highway beneath it, is an imposing ruin. From the earliest times of trade from Africa through the Arab lands and north into Mesopotamia and India and China beyond, there had been some sort of fortification here, enriched by dues from the caravans, 500 camels at a time fed and watered with the merchants in the caravanserai below the crest. More lucrative than Jerusalem, it was a contended castle in the 12th and 13th centuries. Storage rooms, quarters for crusaders, servant’s baths, a prison and cells abound in the edifice above the porous stone with tunnels into it for defensive use. It is now in ruins and not nearly as magnificent as Crac des Chevaliers in Syria, a superb piece of engineering with dressed stones finely slotted into one of the most magnificent military structures ever built. Kerak has is built of roughhewn sandstone, with slits and turrets, and like Crac, with more than its fair share of treachery. The castle could only fall if the crusaders were starved out or through treachery – or both. Beheadings of rivals were common in tribal jostling for control of fertile land and, above all, of trade routes. The crusader leader was quick to learn from his enemies. Robert de Carillion had his enemies enclosed in wooden cages with their heads cushioned so they would not be quickly knocked unconscious before they met their death bumping against the castle walls and the rocks below it, but suffer all the way down. When he was overthrown through betrayal, Robert de Carillion was ‘honoured’ by a public beheading. We hurried off before midday when the prayers poured out from every minaret to echo across the valley. They were all recorded, Ibrahim told us, to coincide in a pleasing blending of multiple prayers. That afternoon families were out to enjoy themselves in the squares, parks and the public garden of the Archaeological Museum and park in Amman. We had our rolls of pitta bread and lamb in the coach before entering the precinct scattered with Corinthian capitals, Roman sarcophagi and a few reliefs. From this hill we could look down on the much restored Roman theater where pop concerts are held and thousands can sit on the hard seats where once the inhabitants of Philadelphia (not, I think, the one that gave its name to the US city – that was, I think, in present-day Turkey) jostled for their free places – ‘bread and circus’ instead of wages. 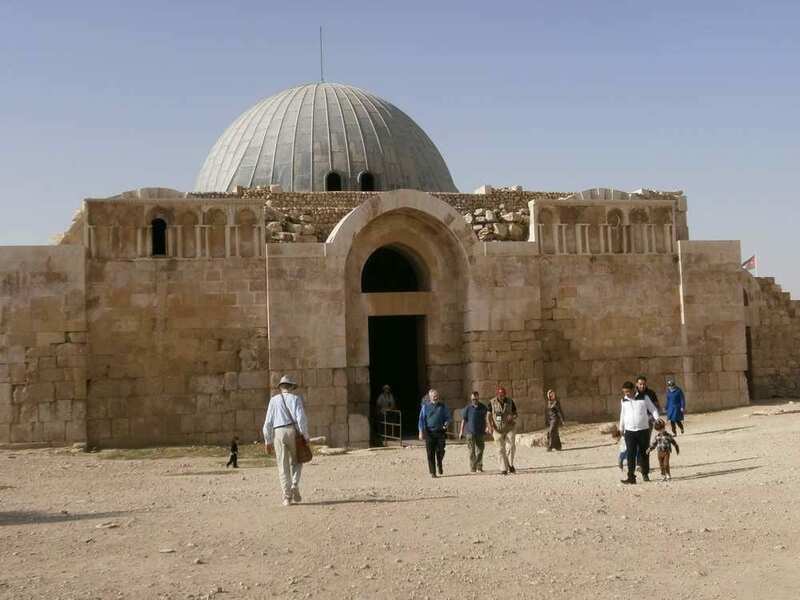 These hills were inhabited before the Romans, but after the end of the Umayyad Empire in the 770s, the city declined and was scarcely more than a village when, in 1946, it was chosen as the capital of the new state of Jordan. Perched high above on a platform stands the ruins of a temple to Hercules, a few columns resurrected, and behind it, using the Roman remains, a Umayyad (660s to 770s) dwelling with mosaics and baths, with the Roman sequence of tepidarium calidarium and frigidarium with mosaic floors supported by columns and pipes underneath. The Umayyads drew on the architecture and art of Byzantium, the era between the crumbling of the Roman Empire and the rise of the Muslim Umayyad one. Layer upon layer of history unravelled before us in the small, engagingly dusty museum clearly labelled in Arabic and English. There was the oldest sculptures known. They look like twins, in plaster hand-moulded into two heads with eyes marked in bitumen from the Dead Sea, thier bodies without legs and arms and with bits missing. One was restored in the British Museum and the other in the Smithsonian. These date from the Pre-Pottery Era around 6000 BC, and could have been made, as cult figures, in the early – or earliest- settled village we had explored near Little Petra. The section on Petra was revealing. The Nabataean civilisation was at its height roughly from 100 BC to 106 AD before conquered by the Romans. A nomadic tribe, it is thought to have come from Saudi Arabia, settled for a while in Wadi Rum before finding in Petra rich pickings managing the spice route from Africa to Asia. Their pottery displayed in the museum was very simple and unsophisticated, and the artefacts showed Hellenistic influences, as did their more ambitious tomb fronts at Petra. Before the Romans, the Ptolemy dynasty dominated this part of the world and Greek was the lingua franca. Perhaps their nomadic origins explain their rapid absorption of Greek art, probably using Greek artists and architects, as the Romans did at Pompeii in the first century AD. We bobbed in and out of the families and couples on their Friday holiday outing, mostly posing in front of the display cases with the ancient ‘twins’ or with the Roman gold jewellery. On our journey north Ibrahim announced we could have a question time in the coach. What I managed to understand was fascinating. His family comes from Palestine. His father was born there and had to leave in 1946 for a camp near Amman where he was born. He pointed out a camp out to us, a tangle of dwellings, more than makeshift, less than substantial or durable and full of children and washing. His father was a teacher. He has Israeli friends who invite him to return to see his father’s birthplace, and will get him the required visa. This he refuses to do. He wants to return freely to his land. I think he has Jordanian nationality which was offered to the early refugees. He has 3 young children, 2 girls and a boy, and would like them to return to a free Palestine.